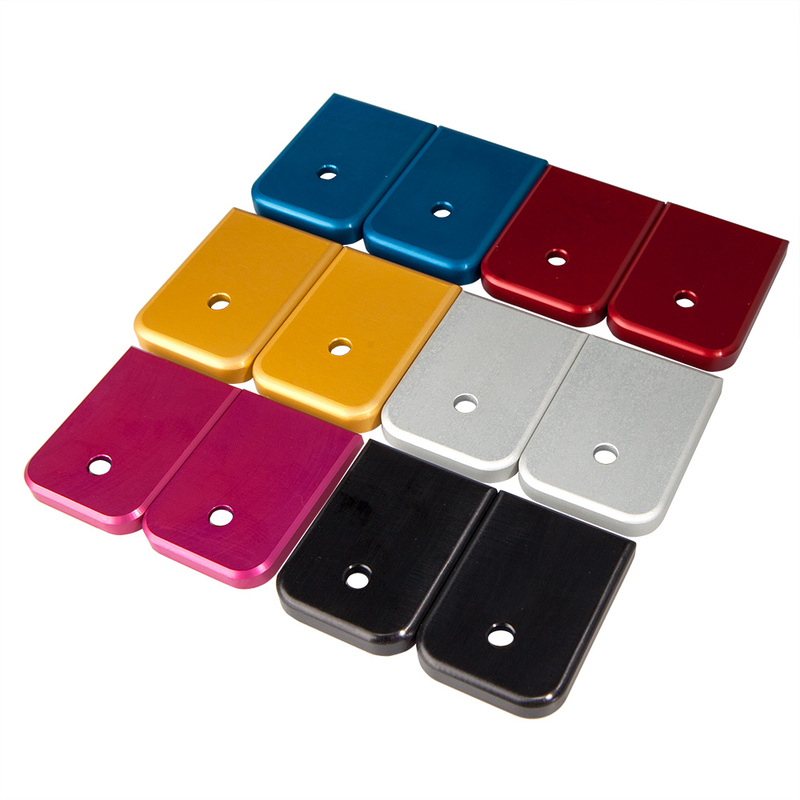 Sold as a set of two, these aluminum base plates replace the factory plastic Glock magazine base plates. Available in Six different colors! This Glockstore Performance & Custom Part is machined in the USA from billet aircraft grade aluminum blocks to create a precision fit intended to replace the original factory plastic magazine base plate. The advantages of aluminum are obvious; stronger, higher tolerances, more precision fit, available in six different colors which can also be laser engraved with your name, ID number, logo, etc so that you can identify your magazine from the rest. These add a little more weight to your magazines for a consistent drop/reload. They look great, and the color matched the extended mag release and slide cover plate that I bought at the same time. Did not match the blue pin/slide release kit, though. Easier to install than the HEAVY EXTENDED ALUMINUM MAGAZINE BASE PLATE, and these come with 2 for the same price. I did not have to shave off the tabs at the bottom of my mags, but I did have to squeeze the heck out of them to get these to get on. Also, the tab on the bottom insert (that installs between the spring and base plate) fits this perfectly, while the tab is too large for the HEAVY BASE. I bought these.... they are outstanding.